I had to keep reminding myself these past couple of weeks that "you can't have rainbows without having the rain." I've finally finished my Rainbow shawl and I love it!!! It serves as a visual reminder so that when times get tough, or my body decides to mutiny against me I can wrap myself in color and know that everything will be all right. I learned a lot during this knitting project. I'm normally more concerned with getting something done or starting something else. I can get pretty distracted and certainly my MS flare-up doesn't help with staying on task. Not to mention while I was knitting the Adara rainbow shawl project this came out so I promptly got the pattern and then went to my LYS with my Christmas gift certificate in hand to get the yarn. Then in the midst of my future knitting planning this came out. All I can say is WOW!!!! I purchased the kit from Kim (who is so very talented and quite nice) and when the yarn arrived I almost cartwheeled through my house (my current lack of intense mobility hindered the ability to cartwheel physically, but mentally I was cartwheeling around the block!). The yarn is so beautiful and both projects are amazing. Needless to say I'm quite obsessed with both the shawl and the scarf especially since there are lots and lots of beads incorporated into the pattern!!! I love beads almost as much as I love yarn so both of these projects have me in a knitting frenzy. 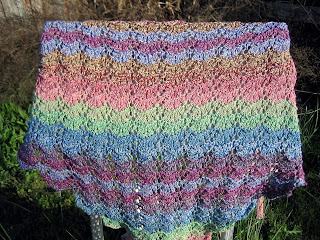 It clearly would have been easy to get distracted but I just kept on knitting my rainbow shawl one stitch at a time. I kept telling myself that as soon as I finished this shawl I could start on one of Susan's projects. She is such an amazing designer and the projects she has "in the works" just blow my mind. I love the fact that not only are her patterns gorgeous but she is also super nice and very active in the forums on Ravelry. It is so nice to like the patterns and the person! So in the midst of this Rainbow shawl I definitely hit a rough patch of stormy weather and I think it is a small miracle that I didn't abandon the rainbow shawl when I came home from the hospital. 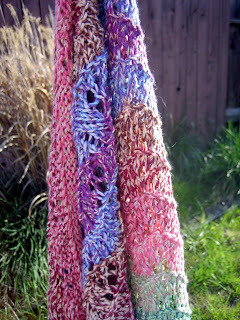 The vibrant colors of this shawl really called to me and I was itching to get back to it while I was sick. Even though my knitting was a bit slower it still only needed one stitch at a time. So slowly but surely I continued the project. I'm also thankful that my physical and occupational therapists both thought knitting was a good idea and I've already had my knitting speed back up to its normal pace. I just had to keep reminding myself that you can't have the rainbow without the rain so even though I hit a rough patch the sky has begun to clear I can enjoy the rainbow in front of me. Now the only dilemma is which project to start next! !